You are receiving this sponsored newsletter as a subscriber to the Notes From the Horn Book or one of our SLJ newsletters. For customer support, or to stop receiving future newsletters from The Horn Book, please scroll to the bottom for instructions. Born of Naomi Shihab Nye's childhood fascination with Oman and a visit there five years ago, The Turtle of Oman is that rare thing in current children's book publishing: a deliberately low-key story in which the climax is—well, read below. After Naomi and I swapped sympathies for how old we were now after our many years of acquaintance, we settled in for a good talk about her new novel. Roger Sutton: How do you keep your enthusiasm? Naomi Shihab Nye: I think it's hanging out with kids all these years. I was visiting a school last week, and they were so incredible. Just being with them for the whole day and listening to their questions and looking at their writing and going into their art classes and seeing the pots and photographs they were making, I thought, "It's okay to get old if you can still hang out with young people and feel that great energy. Because we still have it. It just gets sort of muted." RS: What do you think that does to your writing? Or for it? NSN: We hear a lot of voices every day, but for me the most touching and tender voices continue to be those of kids. They're the most direct, the most unadorned. It calls forth your own kid voice. It keeps it alive. It nourishes it. I agree with people who say you never lose that kid spirit in yourself no matter what age you are. RS: Oh, hell, I never had it. NSN: I think you have it right now. RS: Making up for lost time. The Turtle of Oman is a story about a boy who's moving. Was moving a big thing for you as a child? NSN: It was, but I really did not think of the boy, Aref, as me, ever, when writing the book. Its source was my childhood fascination with the country of Oman. I saw a National Geographic story about it when I was around eight. At the time it was a closed country; no one could visit. I talked to my father. Did he know about it? Had he ever been there? He, too, was interested, so it was a topic we talked about together. And also, as I told kids in Oman when I did go there, my first name, juggled, becomes "Omani." NSN: As a child, I was always juggling words and names. So a fascination with a place. And then when my father died seven years ago, I remember thinking that I was not only going to miss him so incredibly much, but I was really going to miss the relationship he had with our son. They had a very precious bond. My father could walk in and my son would light up, and they would just take off. I wanted to honor that bond between a boy and his grandfather. RS: It really made me wish I had known my grandfather. NSN: That's touching, Roger. A couple of adults have written to me that this book carried them back to their own relationship with a grandparent. So those were the two impulses. Not moving. Moving just kind of came on. When I was in Oman it was staggering to learn how common it was for Omani kids to do what Aref does in this book. I talked to a bunch of them. They said, "Oh, yeah, I lived in England for two years while my parents got their graduate degrees. I lived in the U.S. for three years. I lived in Australia for two years." It was interesting because they'd all gone away and come back. Education is highly valued, and they don't have—or they didn't have, five years ago when I was there—graduate degrees. You had to leave the country to get one. But Oman has a very fine style of life, a very good economic stratosphere, so people want to go back after their schooling. And it's a very gracious, hospitable place. RS: It does seem very gracious and hospitable from your book. When I look at the details in the story, I think, "This is such an alien landscape to what I know." But they're so comfortable in it, the boy and his grandfather. NSN: I've sent a few friends to Oman, people who are on their way to India. They've all had fascinating reports afterwards. RS: Oh, I'd love to go. Even before your book, I knew it from childhood stamp collecting. NSN: So did I! The Tourism Bureau of Oman has a new slogan: "Beauty has an address. Oman." It really is a beautiful place in a striking and rather odd way, because of the mountains being tones of brown, and the city being pale colors. White, butter yellow, beige buildings; and they're all low, because the sultan does not like skyscrapers. And then the sea is so intensely turquoise. So you have these three stripes of color, and then sunrise and sunset above that—it's gorgeous. RS: Let's just bag this talk and go. NSN: Yes, let's. And we'll stay at the Chedi Hotel. Look that up. RS: You did a really good job of letting us know these kid-focused details about that landscape, but in a way that wasn't touristy. It felt like it was coming from the inside. NSN: That's nice. Thank you for saying that. RS: Do you know how revolutionary this book is? NSN: No. What do you mean? RS: Here we have a book about a kid who's going to move. And by the end of the book he hasn't even moved yet. It's so quiet. NSN: I was speaking about The Turtle of Oman to some kids at the school library a beloved friend runs, and I said to them at the very end, "You realize who the turtle is?" They all just stared at me. And then afterwards my friend said, "Aref's the turtle! I didn't realize that." I said, "Yes, he's the turtle." I really long for the slow time of childhood. I think most of us who live in this era do. I wanted Aref to live in slow time, for the book to feel as if it was almost in slow-motion. Like, oh my God, we're back to the suitcase and there's still only two things in it? I wanted it to be weird that way. The head of the Academy of American Poets said, "Poetry is slow art." To me that poetry of daily life that we yearn for is the slow artfulness of movement. I keep this little German quote on my desk: Weniger, aber besser. "Less, but better." Less stuff, less clutter, less things in a day, but better relationships with those things. I wanted there to be some sense of that with Aref and Sidi. RS: How do you think we can convince our publishers and librarians that there is room for this kind of slow book? Everything now is super high-concept. NSN: Yeah, there's all this melodrama and vampire stuff. There's a lonesomeness that human beings exhibit sometimes: I have all this stuff, I have everything at my fingertips, I'm going in all these different directions at once, and I'm lost. Whereas children have a willingness to pause and turn something over and over in their minds. I worry about what happens when you bombard children with too much stuff all the time, too many activities, too many events, too many things. I remember my kid, when he was young—he's now a professor—coming home from school one day when he was in about fifth grade, and I asked him about a certain friend of his. I said, "Do you want to have so-and-so come over after school tomorrow?" And he looked at me, and he said, "Oh, Mom. He's ruined." And I said, "What do you mean, he's ruined?" And he said, "He's just scheduled all the time. He has no free time anymore." I think of that sometimes when I'm feeling frustrated or frazzled, when I haven't spent enough time with something to make it feel meaningful. That's something that teachers, librarians, parents know kids need. RS: The climax of the story is that they catch a fish and throw it back. NSN: The little things that happen are really little. The threads are delicate, but they're also strong. I did thirteen drafts, Roger. In the first draft, the baby pillow that Sidi throws into Aref's suitcase was the star of the book. In my second draft, Aref's house and Sidi's house were the stars. Virginia, my editor, told me, "I don't want a book about a relationship between two houses. They're not even on the same street." So I had to bring people into the book. RS: Oh, God forbid, Naomi. NSN: In talking to kids at schools I've visited, they all seem to have had experiences similar to Aref's, even in the second and third grade. They've moved, their friends have moved, their grandparents have moved, they've changed schools. I often do events with refugee resettlement communities. In some cases I ask people to bring a poem from their country, or just a few lines from a story, or to tell us a story and then translate it. So I hope that readers would feel somewhat at home with Aref, somebody who is being challenged to face this whole new culture and who wonders: where do I find my gravity in it? RS: That gives you a narrative line throughout. He is dealing with anxiety. It's not just a pleasant little wander with Grandpa. There's this fear of what the new place will be like, and as a reader you want that to be resolved. NSN: Right. And the metaphor of going away and coming back, which so many creatures do in their lives. There's this essential tug of home gravity. Aref is going to come back, but it's still scary to think about being gone. NSN: My favorite line in the book is when Aref asks Sidi: "What if they make fun of my hat?" The hats of Oman are so distinctive, and so beautiful. And Sidi says, "Then you can let them try it on." Become me, and then you won't make fun of me. RS: When you're writing a novel, do you ever have to say to yourself, "Wait, I'm being too much of a poet"? NSN: Probably when I overwrite a passage and make it too descriptive. But my poems have always been fairly plain, I would say, and always had a narrative thread in them. My poems enjoy conversation, and they try to incorporate it. But I did end up cutting back a lot of description and then trying to build up conversations or scenes with a little more velocity or energy rather than some kind of dreamy metaphor. RS: I read poetry so differently from the way I read prose. I read a poem through quickly, then look more closely, then go back, and then look at the thing at the end and the thing at the beginning. It's a much more singular moment than the chronology that you involve yourself in when you're reading a piece of fiction. NSN: Right. I wanted there to be little chunks in every chapter that feel poem-like somehow, that carry your mind in that same way, deeply, into a focus, into a moment, and then kind of drift around and blur. But I try to keep it also moving a little bit, even if it's slow-moving. RS: Have you seen any slow TV? It's my new passion. NSN: I have never even heard of it. What is it? RS: It's from Norway. There are these shows—there's one I really love. It's a train. It's nine hours long. They just mounted a camera on the front of the train. NSN: Oh my God. This is amazing. RS: I'll send you a link. Your book kept reminding me of Little House in the Big Woods. RS: Again, very small dramas, just "here's what it's like to live in my little house in the big woods." And the anxieties of oh, Pa's gone, is he coming back? That tends to be the climax of a lot of the chapters. It has so much respect for those small moments that do make up a kid's life. So many books now are trying to distract kids from those moments. NSN: That's right. And I think they're distracted enough, and there's enough that will distract them. Sometimes kids will say to me, "What is the one thing that made you a poet as a child growing up?" And I would say it was an apprehension that there was so much around us that we could easily overlook, it would just slip by. I felt really haunted by that as a child. And by the way, Roger, did you know I grew up in Ferguson, Missouri? RS: No, I didn't know that. NSN: I was born in inner-city St. Louis, and when I was almost three my parents moved out to Ferguson, because it was a suburb, with more trees and little parks, and a quieter pace. So all of this news and all of these images from Ferguson are very haunting to me, because in the time of childhood where I grew up, the whole town of Ferguson belonged to kids. We rode our bikes everywhere. We were really curious about what this black-white line was. It was very, very invisible, but very well known to adults, and we didn't understand it at all. Anyway, that's just a digression. But it has made me think a lot about slow time and that need as a child to be in spots that feel as if they will outlast you, outlive you, be there in some physical way. RS: I like the way that the end of the book makes us wonder what it's going to be like for Aref in Michigan. You can carry this story forward in your head because you get to know this boy really well and hope that things will work out. It's almost as if you can write your own sequel. NSN: A couple of people have bugged me already about writing a sequel, in first-person, of Aref in Michigan, but I thought, "Wouldn't that undercut all the possibilities for him?" I don't know if I would want to do that. People are still bugging me to write a sequel to Habibi. RS: Get busy, girl. It's been a while. NSN: I don't want to write a sequel. I want you to write a sequel. You figure it out. RS: I'm really into standalone books these days. There are too many sequels. NSN: I am too. I'm really into everyone else's capacity to imagine what happens next. I like standalone books. There's something intact about them. And I think poems try to trust us in that way too. It's why poems don't like explanation. What happens next? Where does it go? Poems have that subtlety of ending in air, hinting, suggesting, but now you take it and you go with it. RS: And those are the poems you keep going back to. When you find the one that creates that story inside yourself, that won't let you alone, that's the poem that speaks to you. Naomi Shihab Nye knows that growing up—that being a girl—is complicated. Girls are sisters, daughters, friends, crushes, secret admirers, students, and even more. Girls inspire. They love, hurt, worry, laugh, cry, believe, and hope. 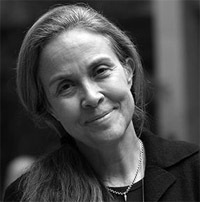 With 72 poems, Naomi Shihab Nye asks secret questions, such as "Does he recognize my existence? / Does he see me gleaming / in my chair?" and makes bright observations, from "Babysitting should not be called / sitting" to "I want to be someone making music / with my coming." This is a collection for every girl who is growing, changing, and becoming—leaping into the wide, open world. New paperback edition! Squirrels Jed, TsTs, and Chai are the very best of friends. So when Jed is snatched up by a hawk and carried away to another realm, TsTs and Chai resolve to go after him. New communities are discovered, new friends are made, huge danger is encountered, and the mysteries of squirrel culture are revealed. (Did you know that squirrels are steadfast and fun-loving?) 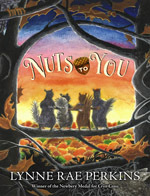 Nuts to You is illustrated in black-and-white on every page by the author and includes an introduction, an epilogue, and funny footnotes throughout. It is a lively, thought-provoking story about the power of friendship and the importance of community. 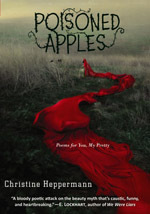 Using fairy tale characters and tropes, Poisoned Apples explores how girls are taught to think about themselves, their bodies, and their friends. 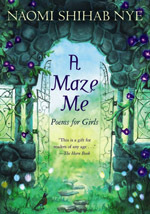 The poems range from contemporary retellings to first-person accounts set within the original tales, and from deadly funny to deadly serious. Christine Heppermann's collection of fifty poems—complemented throughout with black-and-white photographs from up-and-coming artists—stand right at the intersection between powerful age-old messages and the life of the modern teenage girl.